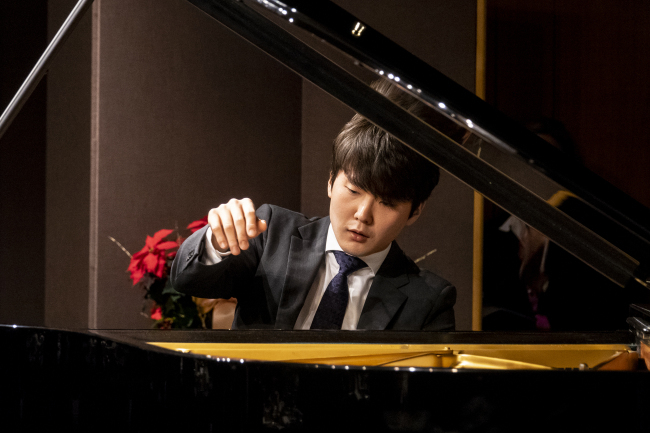 Pianist Cho Seong-jin will perform at the Salzburg Festival in 2020, the year marking the prestigious music festival’s centennial. Salzburg Festival President Helga Rabl-Stadler made the announcement at a press conference Tuesday in Seoul to promote the festival’s lineup for 2019. “It’s a great honor to join one of the world’s most prominent and historic music festivals and also to debut in the year that it would celebrate its 100th anniversary. Though the program has not been decided, I would look forward to making my debut there with a good program,” Cho told The Korea Herald. Cho also played Claude Debussy’s “Reflets Dans l’Eau,” or “Reflections in the Water,” from Images Book 1, L 110 No. 1 and Schubert Wanderer Fantasy in C Major D. 760, after the presentation given by Rabl-Stadler. The Salzburg Festival 2019 will run from July 20 through Aug. 31. During the 43-day period, the festival will hold 199 performances at 16 venues that span across the birth city of Mozart, bringing together new operas, acclaimed orchestras, conductors and soloists. The theme for next year will be myths from antiquity, which festival co-founder Hugo von Hofmannsthal saw as a “magic mirror.” Mythical tales of the past can always raise questions relevant to human existence and the essence of the arts, the president of the festival said during the press conference. “The festival has remained as one of the most beloved music festivals in the world, largely due to its steadfast belief in its founding idea: peace. Its long-lasting tradition of raising serious questions regarding mankind and arts appear to continue attracting the visitors,” Rabl-Stadler added. The summer music festival has annual visitors amounting to some 250,000. About 3,000 were from South Korea in 2017, and that number grew to 4,000 this year, according to Rabl-Stadler. Opening the summer festival on July 27 at the Felsenreitschule theater will be a new edition of Mozart’s opera “Idomeneo” by director Peter Sellars and conductor Teodor Currentzis. Other new opera productions include Simon Stone’s rendition of Luigi Cherubini’s opera “Medee,” Achim Freyer’s version of George Enescu’s “Oedipe” and Barrie Kosky’s festival debut work “Orphee aux Enfers,” originally by Jacques Offenbach. The Vienna Philharmonic, the house band for the summer music festival, has five concert programs. Riccardo Muti will lead the orchestra in “Messa da Requiem” in memory of Herbert von Karajan. Herbert Blomstedt will conduct Gustav Mahler’s Symphony No. 9. Daniel Barenboim will orchestrate Mahler’s Kindertotenlieder and Symphony No. 5 and Franz Welser-Moest for Wagner, Richard Straus and Dmitri Shostakovich. Bernard Haitink will mark the finale of the concert series with Beethoven and Anton Bruckner. The Berlin Philharmonic and its incoming chief conductor, Kirill Petrenko, will also join the festival. Many renowned soloists will also visit Salzburg, including pianists Evgeny Kissin, Igor Levit, Maurizio Pollini, Grigory Sokolov and Mitsuko Uchida. Alongside its wide range of music programs, the festival will house theater works, presentations of drama research and readings.